chemistrydemo.com | Classroom chemistry demonstrations that work. Classroom chemistry demonstrations that work. This is a fun and easy demonstration showing that as the volume of a sample of gas is decreased at constant temperature, the pressure of the gas increases (Boyle’s Law). I find that very few of the students have ever seen this party trick and they are surprised by the result. Some brands of straws work better than others. Make sure to test the straws ahead of time. Make sure to get more than enough straws for your students. This is a trick that can fail when the students first try. My older cousin Mike showed this cool straw trick to me when I was a kid after he got a job at McDonald’s. He learned it from some of the other employees. McDonald’s straws do work really well. 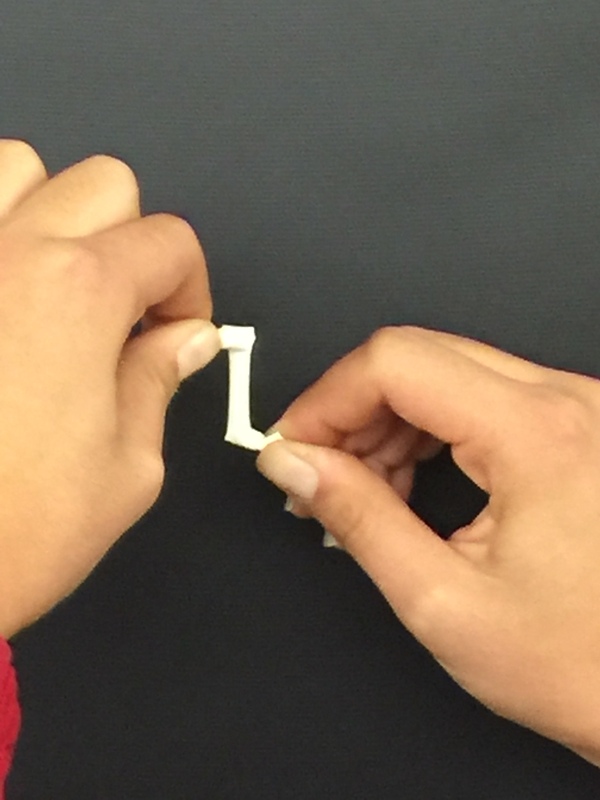 Student 1: Pinch each end of a drinking straw tightly. Roll the straw end over end so that the straw is winding up and the volume within the straw gets smaller and smaller(see pictures below). Once it is too difficult to roll the straw up any more, continue to pinch tightly and hold the straw steady for Student 2 to flick. 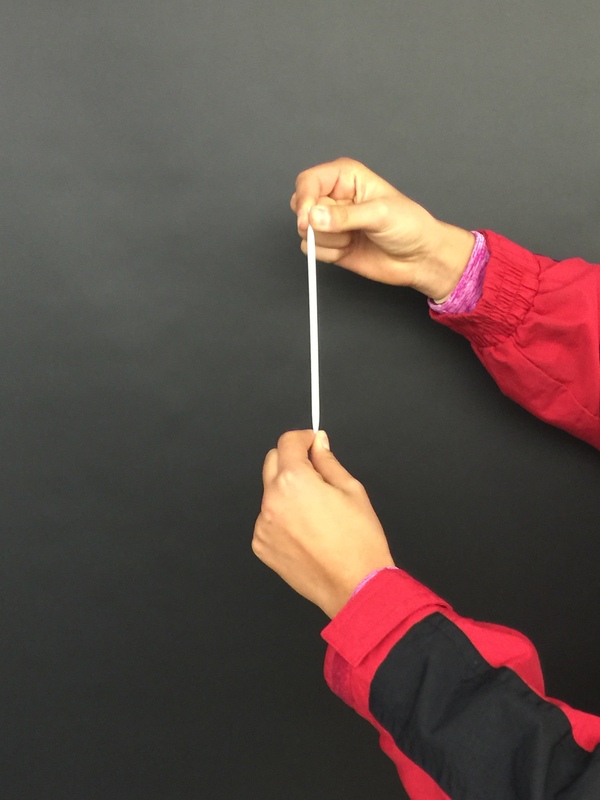 Student 2: Flick the straw with your finger quickly and with force so that the straw pops. As Student 1 is rolling up the straw, the volume of the gas in the straw is decreasing even though no gas escapes. As the volume decreases and the gas particles get pushed closer together, the pressure (gas collisions per time with walls) increases. The juice that can be made from Red Cabbage is a natural pH indicator. Although it will make your house (or prep room) a little stinky, I find the rewards well worth the smell. It is a universal indicator and changes to many different colors – see below. I use the indicator to have the students test the pH of many household products. These include many cleaners, ammonia, Liquid Plumber, bleach, lemon juice, milk, orange juice, and anything else I can find in the house. In general, foods often test in the acidic range and cleaners test in the basic range. One point you could make to the kids is that red cabbage is sometimes more red and sometimes more purple at the grocery store. This is due to the pH of the soil in which the cabbage was grown. Make sure that Ammonia and Bleach based products are not mixed. The reaction between these compounds is a chlorine-based gas that is poisonous. I put my cabbage juice in a big jug that has a spout on the bottom. This makes it easy for students to get a little of the juice out of a big container. Milk may not indicate too well. I first learned about this demonstration as a MAT student at Union College from another student – most likely my chemistry partner Lisa Saccochia. Chop up a head of red cabbage. Put cabbage in a large pot and fill with water. Heat mixture on stove to a boil and allow it to simmer for a half hour or so. Strain cabbage out of mixture – collect dark purple cabbage juice. Put cabbage juice in container. It can be diluted greatly so add as much water as you like to make the volume of juice you desire. Demo #33 – What is your radiation dosage? While discussing Solution Equilibrium in class, I try to make a point of describing Global Warming and how the CO2 dissolved in the oceans may play a role. We then discuss how we can reduce the amount of carbon from fossil fuels that is being put into the atmosphere as CO2. My feeling is that the electric car is the future – but how do we make more electricity without using more fossil fuels. Nuclear power plants seem to be the answer. They do not create any air or water pollution (on good days and almost all days are good days) and seem to be sustainable if the recycling of the waste is as possible as is currently being stated. Later in the year, during my Nuclear Unit, I show the “Back to Chernobyl” and “Chernobyl Heart” videos to my students. They see the immediate effect of a meltdown and the effects that are still occurring in Russia. We discuss Global Warming again and whether the students still feel as strongly about Nuclear Power being the answer. It is a tough call for many of them. As part of that class I pass out the “Estimate Your Personal Radiation Dosage” from the American Nuclear Society that can be found on the next page. The students always seem to like to find out if they receive a high dosage and where their dosage comes from. You might be surprised by students who have had large doses. I once had a student that had to have many X-Rays in one year due to kidney problems. Her dosage for the year was far above normal. The American Nuclear Society offers guides for teachers. This is a worksheet that was enclosed in one of these guides and is used with permission from the American Nuclear Society. This is about as easy a demo to do as there is and it has good Real World Connections. I first show the students this demo in the Solutions Unit to illustrate that “Like Dissolves Like”. I use it again in the Organic Unit to re-illustrate the point. This demo can be used to alter the Paper Chromatography Demo in the Physical Chemistry Unit to show general solubility issues and how they affect the Separation of Mixtures. The more porous the object you write on, the harder it will be to remove the ink – don’t use paper. Don’t allow the permanent marker to stay on the object for an excessive amount of time – it may be difficult to remove completely. Acetone will dissolve plastic. Make sure the object you write-on is not dear to you. Try using Nail Polish Remover instead of Chemical Storage Acetone to show how students can remove Permanent Marker at home. This is one I came up with myself, though I’m sure that many other teachers have thought up and used this demo for an example of “Like Dissolves Like”. Write-on Dry Erase Board with both Permanent Marker and Water-Based Marker. Wash off the Water-Based Marker with a wet paper towel. Show how the Permanent Marker still remains. This demo is great at illustrating the difference between Non-Polar and Polar Substances and how “Like Dissolves Like” (Non-Polar dissolves Non-Polar and Polar dissolves Polar). To relate this to the Real World explain how the common term for Non-Polar mixtures is “Oil-Based” and for Polar mixtures is “Water-Based”. This is why there are basically two types of paint: Oil-Based and Water-Based. This is also why a mechanic might use gasoline to wash grease off his/her hands instead of water. Acetone – it is recommended that you use gloves when handling acetone. This is a demo I have used the first day of school. It is simple and relays to my students that the class will be fun, but that they will need to be able to learn and have fun at the same time. As simple as it is, students are amazed by this demo. Parents are equally as amazed when I show it to them on Parents Night. The concept shown in this demo has a couple of different terms depending on what course and depth you are teaching the concept. I remember in 7th grade technology and in Earth Science the concept being referred to as the “cohesion” of water. This term is also commonly used in the real world. In chemistry, we refer to this as “Hydrogen Bonding” – the intermolecular force that causes certain compounds to be very attracted to each other. Hydrogen Bonding is the reason why water and some other compounds have higher than expected boiling points. Make sure to soak your string for a little while ahead of time. You want the string to be fully saturated with water. Have students make guesses as to why the “string” is so magical. Try it with dry string and show that it is not the string at all. Make sure that the string is taught – it doesn’t work well if it is not. See how long a piece of string you can use and still get water from one beaker to another – the longer the string the more water that will be required. (I’ve gotten it to work with string that is more than 20 ft. long with help from students (sorry, around 6 m)). Paul Scott, a science teacher from Niskayuna High School in Niskayuna, NY was the first person to show me this demo. Paul was my “Science Methods” professor in the MAT program at Union College in Schenectady, NY. He, more than any other person, molded my teaching philosophies to use demonstrations and science news as key components of getting students to think analytically while getting them excited about science at the same time. The procedure I have written up is based on the demo Paul first showed me. 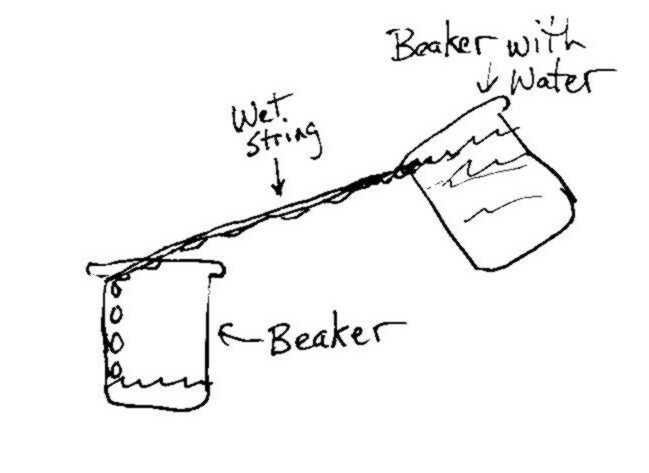 Fill 1 beaker with water and add string so that it has time to soak. Take wet string out of water. Hold the string between the 2 beakers and elevate the filled beaker higher than the empty beaker. That it is the water on the string, not the string itself, that is allowing the water to be transferred. Try repeating the demo with dry string – the water will pour onto the table no matter how slowly you try to pour it. Water molecules are attracted to other water molecules. It can be said that water has strong intermolecular forces, strong attractive forces, Hydrogen Bonding, or cohesion. The reason that the water can “walk” across this string is the same reason that water has a higher than expected boiling point. My name is Bill Brown. I have been a high school chemistry teacher in New York State for the past 12 years. As a high school chemistry teacher, I love to present demonstrations that reflect the concepts that I teach. I have collected many many books of demonstrations. They vary from books on how to make concoctions with kids up to university level demonstration books. Finding demonstrations in these books that are simple and straightforward and pertain to the concepts that I teach in high school chemistry is quite arduous. Finding demonstrations that fit this criteria and actually work is more difficult still. The goal of this blog is to present some demonstrations I currently use in my classroom and to create a dialogue that will help all of us improve in our ability to teach chemistry. I will try to present each of the demos in such a way that you can download a .pdf version that would be worthy of printing and keeping in a binder so that you can create a demonstration book of your own. Thanks for reading and sharing your ideas with me.